STRATEGY: Leveraged high performing PPC ad copy and trackable phone numbers to increase organic conversions for key pages. RESULTS: Up to 52% increase in organic CTR over a 3 phase test and learn approach. Proof of strategy to holistically implement. A pioneer in the hospice movement since 1978, VITAS Healthcare is the nation’s leading provider of end-of-life care. According to Google Trends, searches for hospice services are steadily increasing YoY, peaking at an all time high this month (July 2017). Seeing this digital trend, VITAS recognized their success in search as a key pillar in the success of their business. VITAS partnered with Seer Interactive to develop and execute a targeted, innovative plan. Seer knew that in this industry, improvement in SEO results and rankings are all about providing the most relevant, accurate, and helpful leading content — extremely important for a field that often has many myths to overcome. Executed over 9 months in 3 phases with the goal of understanding success and creating buy-in for scale of the implementation in a phase 4. Seer lifted language from high performing PPC ad copy (based on strong conversion rates) to craft new organic meta descriptions that focused on putting the user in front of relevant and helpful content for their query. The decision to seek hospice care often comes when families are experiencing a crisis. Seer included trackable phone numbers as a solution to connect the searcher with help as immediately as possible. APPROACH: Used high performing PPC ad copy to update the meta descriptions of 10 URLs with the goal of increasing CTR and overall leads for VITAS. RESULTS: CTR for test pages increased 52%. APPROACH: In addition to using PPC ad copy to inform the descriptions, we tested adding a phone number in the meta descriptions to see if there would be an impact on organic call volume. This means that the main KPI in this case was call volume instead of an increase in CTR, so we did everything we could to ensure that we could accurately measure impact. Why add phone numbers? Phone numbers in results are patient-focused, making access in a crisis situation easier for patients and families to get access to help (one less hurdle to navigate online). We chose pages that were ranked on pages 1-2 of the SERPs but that had a lower than average CTR. We selected pages that target users near the top of the funnel, in order to entice them to make a call. For the 8 pages with updated meta descriptions, organic CTR increased ~14%. Phone number in the meta descriptions brought in 22 organic lead calls. Addition of phone numbers in organic listings did not cannibalize PPC click-to-call performance — calls from PPC during the phase 2 test increased +2% vs prior 3 months. APPROACH: Based on learnings from phases 1 and 2, we scaled by identifying 6 more URLs that could benefit from phone numbers in the meta description. The 6 additional landing pages tested resulted in an average increase in CTR of +36.24%. This increase in CTR occurred despite a slight average drop in rankings. Organic traffic to those landing pages increased slightly, despite a 26% decrease in organic impressions. Phone number in the meta descriptions brought in 79 organic lead calls. 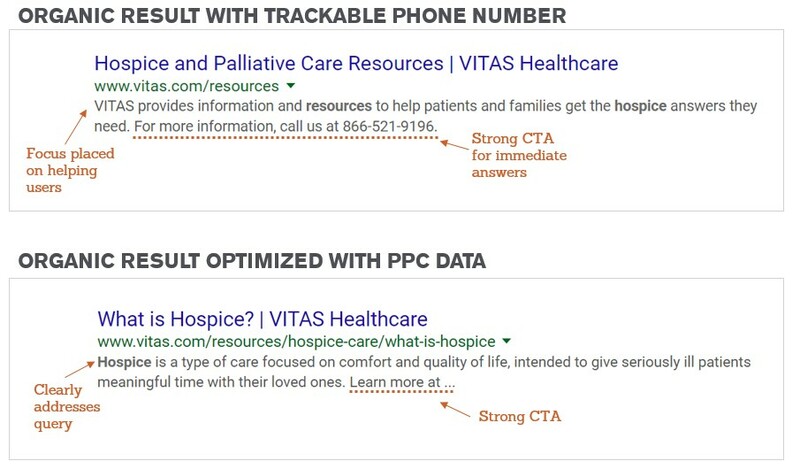 HOLISTIC IMPLEMENTATION: Based on our learnings from the phases performed, we are now stepping back from this small-batch testing process to complete a thorough review of VITAS.com to find every opportunity we can to add a phone number to either the title tag or meta description. ORGANIC CTR GROWTH: Through each phase, we consistently saw CTR grow (+52%, +14%, +36%). PPC BONUS: The inclusion of the phone number in organic listings did not cannibalize calls from PPC campaigns – actually supporting an overall increase in call volume across both channels during the test windows.